Open shelving is essentially an organized decorator’s fantasy. It forces one to keep the kitchen clean, encourages thoughtful decorating, and serves as a multifunctional space that can double as a pantry just as easily as a dinnerware storage vessel. Not to mention: It’s serious design Insta-bait. Need proof? 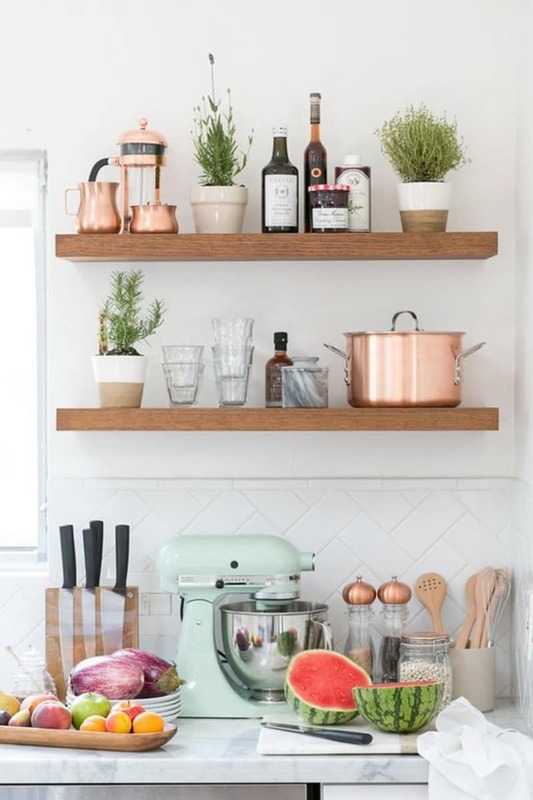 Read on to the beautifully-styled open shelves that will inspire a kitchen makeover, courtesy of the internet. We’re fans of open shelving in all its iterations, as evidenced by this cute little setup that blends a more traditional option with shelving meant to look like a cabinet. When your mug collection looks this great, why would you hide it behind cupboard doors? sunday: endless coffee, open windows, gillian welch & turkey tomato quiche for lunch 🍅🍳trying to use up the mountain of eggs that keeps growing 😋 happy weekend friends! Wooden shelving provides just the right amount of contrast to an all-white countertop and backsplash. Naturally stained wood with clean lines works well with practically any kitchen design—including Scandinavian, mid-century modern, and even rustic styles. For the kitchen that’s lacking counter space, take things to new heights by opting for a series of stacked open shelves that can double as a storage solution. Vintage finds abound in this carefully color-coordinated kitchen nook If your kitchen pieces are more like reclaimed artwork, display them proudly. The commitment to a specific warm-toned color palette in this particular spot makes the design moment all the more bookmark-worthy. For proof that open shelving can be totally minimalist, take a look at this simple, clean space. Adhering to a pared-down palette and incorporating modern pieces streamlines the look and doesn’t overwhelm the homeowner’s self-described “tiny” kitchen. Another great aspect of open shelves? They’re ideal for displaying all your artisanal spices, oils, and jams. Between the retro appliances and little pops of greenery, there’s not much we don’t love from this kitchen corner. Create the perfect multifunctional storage space by wrapping open shelving around your kitchen walls, and using it to house smaller accessories, dinnerware, accent pieces, and even food. Just because space is tight, it’s no reason to dismiss the idea of open shelving. This petite nook takes full advantage of limited square footage with a few well-styled shelves that don’t overcrowd. Get creative with the shape of your shelving! The style of this open cabinetry adds interest to the kitchen and creates even more surface space on which to store decorative items and essentials. Given the simple white backsplash and understated neutral palette, the shape of these shelves is what makes this space feel unique. If all you have to work with is a corner nook, consider this idea for open shelving at an angle. For a more rustic look, opt for natural wooden shelves—you can even easily DIY this by picking up some wooden slabs and choosing your own brackets for a custom feel (try this wishbone bracket for a minimalist look). Sleek wooden shelves bring about a natural detail and a hint of warmth to this elegantly monochromatic space. Designate your most eye-catching dishes to an open shelf for a functional display that proudly shows off your style. This full wall of neatly stacked servingware is the open shelving system of our dreams. If only we owned so many lovely sets of pots, pans, and dishes. Just one question—may we cook something in this kitchen, please? White and wood tones often receive top billing when it comes to kitchen shelving, but this sleek black design is giving us second thoughts. With brass hardware adding a touch of bling, these shelves are over-the-top glamorous. By removing cabinet doors, you can create an open shelving system without ever hammering a single nail. This look is a gorgeous mix of farmhouse and modern design, with an added punch of character thanks to the addition of beadboard at the back of the cabinets. Open shelving adds a rustic-modern feel to a kitchen that is otherwise very traditional and romantic in design. It seems that cabinets sans doors are trending at the moment, and we’re in love. Painting the cabinet interiors a contrasting color highlights the shelves and adds a modern touch to a look that tends to lean towards country-chic. Bridge two overhead cabinets with a system of short open shelves. For added character, opt for a material or color that contrasts with that of the existing cabinets. Bold blue kitchens are trending right now, and there’s so much to love about this gorgeous space. A modern open shelving system works perfectly within a space that’s rustic and sophisticated all at once. Rather than keeping glassware stashed away in a cabinet, display frequently used pieces on open shelves, which adds a touch of sparkle to the kitchen without overly cluttering it. The next best thing to having a window behind your sink is a set of well-styled open shelves like this. If you have available wall space, open bookshelf-style shelving is a chic alternative to cabinets and pantries. A separate countertop nook combined with a series of open shelves creates the ideal coffee, food prep, or baking station. With open shelves, styling is key. It’s not always about dishes and glassware; mixing in artwork, candlesticks, greenery, and other accessories curates a vibe that dishes alone simply can’t achieve. Sometimes all it takes is a single well-styled shelf to make a serious design statement. We’re glad the blue kitchen trend also includes open shelving—especially when they’re as glamorous as these. If ever a kitchen looked well-traveled, THIS is it. This has been described as a Santorini-inspired nook, and we couldn’t agree more. We love the breezy, beachy vibe! This story was originally published March 23, 2017. It was updated April 13, 2018.